This year the annual Winter Day on the Trail will be taking place on the Slocan Valley Rail Trail takes place on Family Day, Monday, February 18th from 11 a.m. to 2:00 p.m. The crew from the Slocan Valley Heritage Trail Society (SVHTS)will be partnering this year with Slocan Valley Recreation to offer a fun-filled afternoon. The event will be set up at the Winlaw Station and Trailhead. Like last year we will be hosting the very popular ski waxing demo (even the newest skis can benefit). For a $15 donation they may even wax your skis! But come early, to make sure your skis get done. Of course, everyone is invited to come out and explore the Rail Trail and see what winter has to offer this year. The swans have been seen all along the Slocan River and you might find a few hanging around. There’ll be a bonfire going and refreshments, a hearty bowl of chili and hot dogs will be available. It’ll be a great time to catch up on what’s been happening on the Rail Trail and what the future brings. Memberships will be available if you wish to support the Rail Trail. All proceeds of the day will go towards maintaining the Slocan Valley Rail Trail. It’s been a winter of minimal snow which has made it a challenge to groom and trackset the Rail Trail. That said, all the Rail Trail has been groomed as of January 14th, so please get out and take in some valley skiing. The Rail Trail will be closed Mon. Nov. 5th through Wed. Nov. 7th 1 km north of the Winlaw Bridge crossing due to construction. No foot, bicycle or horse traffic will be permitted during this time. If traveling along the Trail, please detour to the highway between the Winlaw Bridge Rd and Telford Rd. Sorry for any inconvenience. To the woman who lost a personal item at our recent Fall Colours Ride. The item has been found and can be collected at the Dam restaurant and Bar. On Sunday, October 14th, beginning at 2:00 p.m., why not support the Slocan Valley Heritage Trail Society’s (SVHTS) at this year’s Fall Colours Ride and Fundraiser? Starting at the new South Slocan Trailhead the event’s theme is ‘Anything with Wheels’ to highlight the unique 4 km paved section of trail and the artistic wonder of the new tunnel. 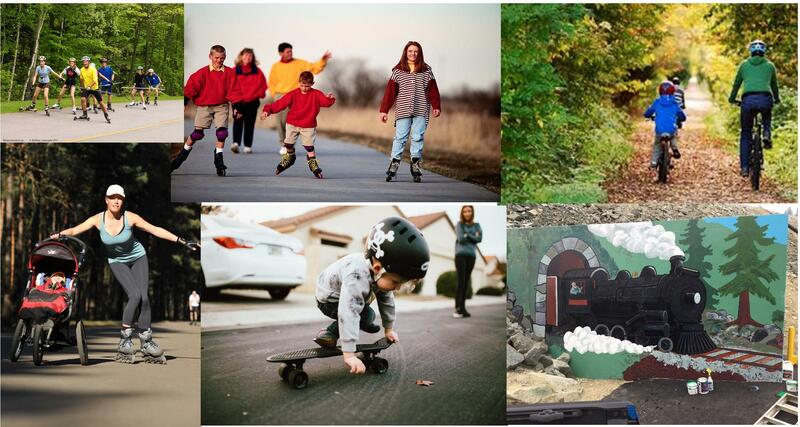 ‘Wheels’ can be bicycles, trikes, roller blades, long boards, skate boards, push scooters, in-line skates, wheel chairs, baby-buggies, cross-training gear and of course walking and running will be okay. The ride will be from South Slocan to Crescent Valley and back, or as far as folks want to go. With a great deal of support from The Dam Restaurant & Bar in South Slocan, the afternoon culminates there with a Burger & Beverage Fundraiser as well as a silent auction with donations from area business, services and artists; and the grand raffle draw. There will also be live music from a variety of local musicians. Burger & Beverage tickets are $20 (proceeds to the Rail Trail) and include your choice of Cheeseburger, Chicken Burger or Veggie Burger with Fries and a choice of a glass of beer, wine or fountain pop as well as entry into the grand raffle draw and can be redeemed any time through the day (Restaurant opens at 11am). . A special surprise is being organized for all the kids who come along for the ride, compliments of Frog Peak Cafe. The silent auction items will also be available for bidding all day. The successful auctions winners and raffle draw winner are announced at 6 p.m.. Burger & Beverage Tickets can be purchased in advance from The Dam as well as Rail Trail Directors or you can get them at the ride registration the day of the event. All proceeds from this event will be going to the Slocan Valley Heritage Trail Society to help with the on-going maintenance of the jewel of the Slocan Valley – the Slocan Valley Rail Trail (SVRT). The ride begins at 2 p.m. with registration running to 3 p.m. at the new tunnel entrance below the Dam Restaurant & Bar. Every entrant will be eligible for the grand raffle draw. Tickets will be on sale there for the Burger and Beverage special for folks to enjoy after their hearty workout on the ride. Kids will also be getting a ticket for the Frog Peak surprise to enjoy after their ride. As well, Rail Trail ball caps and memberships for the Rail Trail Society will be on sale. The silent auction will run until 6 p.m. So why not come out for a ride and experience the newest section of the Rail Trail? Bring the family and friends and enjoy one of the most scenic Rail Trails in the province. What better way to finish off than by dropping in for a bite at the restaurant, listening to some great music and putting a bid in for some great auction items? For more information call 1-888-683-7878 or email info@slocanvalleyrailtrail.ca or contact the Dam Restaurant. Not only has the recently completed South Slocan Overhead highway construction project removed many dangers away from driving Highway 3A/6 for daily commuters near Slocan Village Road, but the new pedestrian/cycling tunnel is now more eye-catching than ever thanks to a mural project coordinated by local artist Peter Vogelaar. The aging structure, built in the early 1960s west of Nelson, was replaced with road fill for improved safety, efficiency and better trail access for users of the Slocan Valley Heritage Trail, which runs under the road. “I think the collaboration between all the partners involved in the project was an amazing thing that would be in my top five, but the enhanced safety of the highway corridor is always our goal at the Ministry of Transportation and Infrastructure,” said Robbie Kalabis, project manager for the MOTI. Helene Dostaler, Chair of Slocan Valley Trails Heritage Society, couldn’t agree more. The recent laying of pavement along with the opening of thenew pedestrian and cycling tunnel, marks the completion of the South Slocan Overhead project. 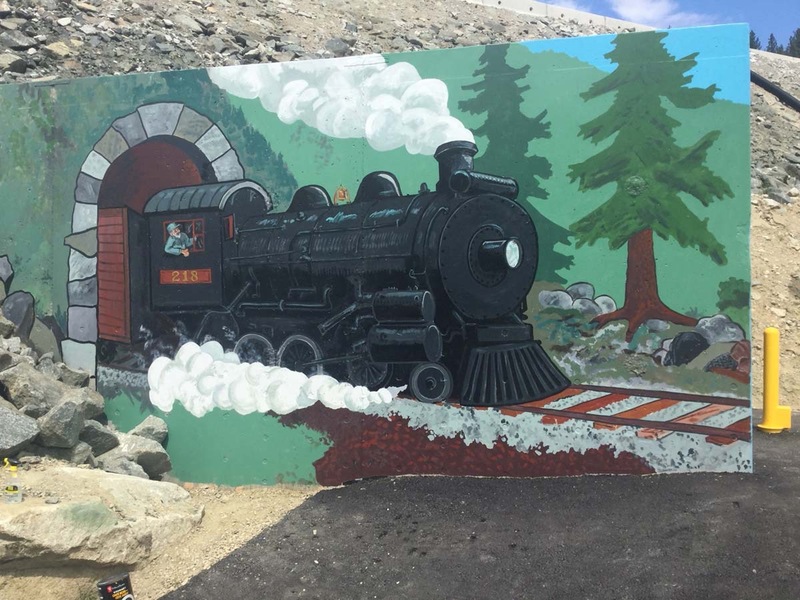 The murals, funded by Slocan Valley Community Arts Council, MOTI and YRB, were an afterthought that definitely has brought life to the tunnel and Mile Zero of the Slocan Valley Trails. Stakeholders were worried some members of the public would scar the tunnel walls with inappropriate graffiti. So, the call went out to local artist Peter Vogelaar to draft up the new design for tunnel walls. Dostaler said the mural project took more than two months to complete. Now, with the four kilometers of paved trail — from the tunnel project to Frog Peake Café — the 52 kilomters of trails are starting to take shape. “The refurbished trails have become a magnet for young families, who now come out and because it’s so safe for kids learning to bike or for kids biking with parents or roller blading on the paved trails,” Dostaler said. Dostaler said the Slocan Valley Rail Trails Society, which is in the process of beginning another major project near the Village of Slocan, is a non-profit organization that maintains trails during the summer and winter, the latter laying down cross country ski trails. The society operates by donations and grants. If anyone would like to volunteer or donate to the upkeep of the trails, go to the SVRTS website or its Facebook Page. The original two-lane South Slocan Bridge, which was built in 1962, was dismantled and replaced with a new two-lane rock fill, and a pedestrian and cycling tunnel. The Ministry of Forests, Lands, Natural Resources and Rural Development cost-shared on the pedestrian tunnel and the trailhead construction, which includes a paved parking lot, access trails, picnic tables, kiosk and bike racks. The Regional District of Central Kootenay, on behalf of the Slocan Valley Heritage Trail Society, cost-shared on the pedestrian tunnel and asphalt paving of four kilometres of the southern rail trail, with a grant from the ministry’s BikeBC program. The paved rail trail from South Slocan to Pass Creek Road is an enhancement to multi-modal transportation in the area, connecting the community to local schools, the recently rebuilt Crescent Beach Regional Park and the Great Trail. This year the annual Winter Day on the Trail will be taking place on the Slocan Valley Rail Trail takes place on Family Day, Monday, February 12th from noon to 3 p.m. The crew from the Slocan Valley Heritage Trail Society (SVHTS)will be partnering this year with Slocan Valley Recreation to offer a fun-filled afternoon. The event will again be setting up at the Winlaw Station and Trailhead. Like last year we will be hosting the very popular ski waxing demo (even the newest skis can benefit). For a $15 donation they may even wax your skis! But come early, to make sure your skis get done. 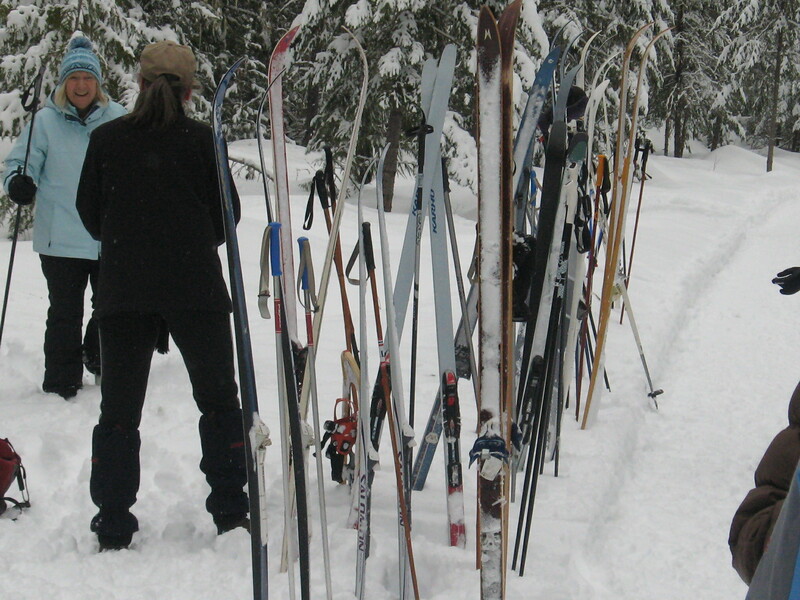 Slocan Valley Recreation will be offering skis for kids and snowshoes for adults to use, should you not have them and want to be part of the Trail experience. There will be individual and group lessons being offered that might make your skiing experience even better. Both in classic and skate skiing! If conditions allow, a track may be set up around the Winlaw School field for some fun races and games. Of course, everyone is invited to come out and explore the Rail Trail and see what winter has to offer this year. The swans have been seen all along the Slocan River and you might find a few hanging around. There’ll be a bonfire going and refreshments and hearty meals will be being sold by trail supporters from Winlaw School. It’ll be a great time to catch up on what’s been happening on the Rail Trail – a new website has been launched and this past summer saw paving of the Greenway Project taking place in the South Slocan to Crescent Valley segment of the Trail .